Over the next few weeks I’ll be posting a different bread pudding variation recipe. These were all done last year, as a project for an Advanced Baking Skills class. I’ve started off with the Control recipe, but you’ll be able to see this same recipe adapted and become: Vegan Bread Pudding, Dairy-Free Bread Pudding, No Sugar Added Bread Pudding and Reduced Calories Bread Pudding! Bread Pudding has been one of my favorite desserts for as long as I can remember. This is by no means a classic or traditional bread pudding, but my Mother’s recipe. Yes, there are prunes in the syrup and I promise you’ll love them. Tear the bread into small chunks in a large bowl. Whisk eggs with baking powder in a separate bowl. In a sauce pan, combine milk, sugar, vanilla and butter and bring to a simmer. Temper into the eggs and then pour over bread chunks, allowing them to soak up as much liquid as possible. Butter and dust with brown sugar the pan and pour bread mixture into pan. Bake for an hour or until golden brown and cooked but still moist. Syrup: place prunes, water and sugar in small pot until it reduces to a syrup consistency. Flavored as desired with rum and vanilla. Pour hot syrup over hot bread pudding and let sit. I like my bread pudding served COLD. I know traditionally Americans eat bread pudding warm, with an accompanying sauce and ice cream. Try this and you’ll love the simplicity of it, making you a bread pudding lover for life! What’s your favorite bread pudding recipe? Share a link! That’s not Dominican Bread Pudding. It’s too dry and you can still see the bread pieces. 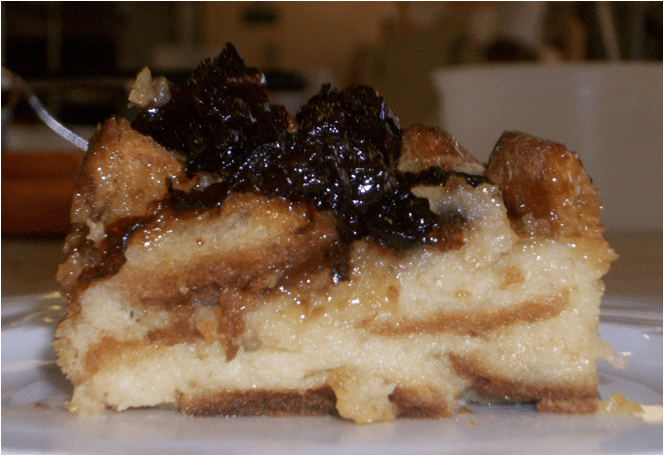 Dominican Bread Pudding is dense and soaked in custard so it all melts together. Your bread pudding looks quite good. I have never been a huge fan of bread pudding, but after having this Chocolate Bread Pudding in New Orleans and making it at home, this recipe has to be my favorite http://tinyurl.com/4dww5zk. I might now be a convert! Oh my does this look so good. I love all bread puddings and I love prunes. I’m so trying this! Nelly, I’m sitting here drooling over that photograph. Most people think prunes are for the over 70 crowd but I love them cooked with food. I have never used them with bread pudding but I’m going to have to. This looks too good. I was going to make white chocolate mousse for dessert tonight but your bread pudding has won me over. This looks absolutely delicious. Recipes handed down from our moms are usually the best and I am sure you have made her proud with this! Looking forward to seeing alot of variations on bread pudding and hope you include sauces to go with each. I personally enjoy warm bread pudding with a caramel sauce and either whip cream or ice cream. Sometimes I make it with banana bread or cinnamon bread just to add to the flavors. Can’t wait to see where all you take this. ahhhhhhhhh this looks soooooooo comforting and delicious. i wish i had a fork to eat that picture right off the screen. and i love the idea of using prunes! it has great flavor and it’s a wonderful sweetener that is overshadowed by dates! mmMMmM. and rum? you can’t go wrong with that!!! I also happen to love prunes, so this looks amazing. I don’t have a recipe for my favorite bread pudding, but when I was growing up there was always apple slices in our family’s bread pudding and I seem to recall a gooey sticky yumminess on the bottom. I think I’ll have to call my mom to see if she has the recipe!